Read and count along with Dr. Seuss and George Booth’s classic Beginner Book full of errors. This is no ordinary day! There’s a shoe on the ceiling and bananas in the apple tree, and it only gets wackier. From a hole in the kitchen table to a green sun in the sky, young readers will love finding each silly mistake. 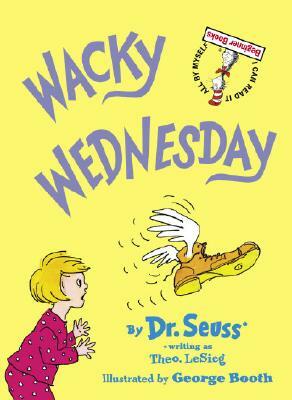 Illustrated by renowned New Yorker cartoonist George Booth, Wacky Wednesday is impossible to forget.